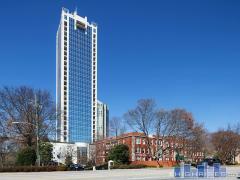 The View at Chastain is a high-rise luxury loft building near Chastain Park in Buckhead. You’ll have access to all the wonderful entertainment and shopping options Buckhead has to offer. Plus, you’ll be able to enjoy the view from your private balcony, and entertain in your spacious home with high ceilings and high-end outfitted kitchen. The Views offers its owners a swimming pool, fitness center, storage, concierge, storage and saunas! An excellent example of refined loft living spaces, this property has exposed pipes, ceiling to floor beams, and industrial stairs yet retains its refined aesthetic. In this location, there's no need to make plans; nearby Chastain Park has concerts and activities all summer long. Have any comments or questions about View at Chastain? Ask your question and/or share your thoughts about this Building. are any of these condos for rent? Or buy only?